'How can I get there?' asked Dorothy. 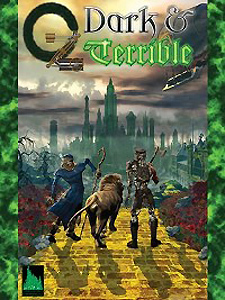 Oz: Dark & Terrible is a roleplaying game with a vision of Oz that would give L. Frank Baum nightmares. The Emerald City is a dystopian steampunk metropolis ruled by the Wizard in eternal opposition to the magicians of Oz. The Witches rule the four main Realms, but whether they are Good or Wicked is entirely dependent upon your point of view. You play the part of an Outsider who has stepped into the middle of a cold war. Or, you can choose to play a native Ozite, such as an Anidum, Automaton, Gillikin, or Munchkin. After spending only a short time in the Land of Oz, you will find it is much easier to get into Oz, than it is to get home.